Doesn’t that wonderful title just give you a sense of quiet devastation? But I’ll get back to that in a bit. When reading an author’s work for the first time, I usually prefer getting my hands on a short story collection of theirs, if they have any. That way, I’ll have the option of looking at the rest of their work without having to leave for another webpage or something like that (and because I just really love print books). And if I perceive that their stories just aren’t my thing, well, there’s no loss or shame in having a book I didn’t like/finish. I know so many people whom the book might fit better with. 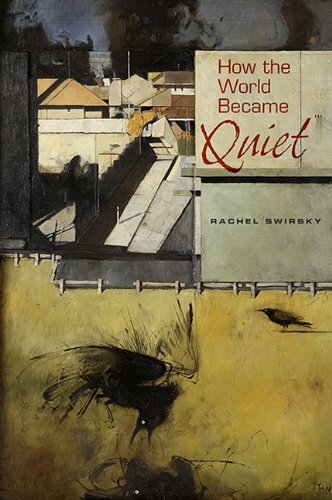 This book was my first foray into Rachel Swirsky’s writing, of which I’d heard so much about. I have to admit that I was a little hesitant because I couldn’t recall where I’d seen or heard her name before and no story of hers had come to mind. I was still a little hesitant as I read through the first story in How the World Became Quiet: Myths of the Past, Present, and Future, which was the Nebula-winning “The Lady Who Plucked Red Flowers Beneath the Queen’s Window.” In it, a murdered sorceress’s spirit is doomed to be summoned again and again over the centuries, until the ending of the world. It was gorgeous and detailed, but the scale of it completely surprised me and I couldn’t quite stop frowning at the text. But there was sharp insight in there and an entrancing melding of searing loneliness and hope beyond hope–I think that’s what kept me reading. I wasn’t all too into “A Memory of Wind” either, although my guess is because I have reached my saturation point with Greek myths. The story that finally made me feel glad about reading on was “Monstrous Embrace,” the third tale in this collection. Swirsky’s point of view character is–get this–the spirit of ugliness present in various aspects of a rather generic fairy tale prince’s life. How the World Became Quiet is divided into four parts: Past, Present, Future, and The End. Most of the fantasy stories are in the Past and Present, the science fictional ones are squarely in the Future, and science fiction and fantasy are side by side in The End. I usually lean toward fantasy in my reading, but I think I enjoyed Swirsky’s science fiction more. I think it helped–although it wasn’t that big of a reason–that Swirsky’s science fiction stories were shorter than the fantasy ones. I definitely breezed right through that section, whereas it took me the better part of August just getting through the Past and the Present. Those two sections have their fair share of novelettes, whereas the Future and the End have some very short ones less than a handful of pages long. The only story that I didn’t read in the whole collection was “The Adventures of Captain Blackheart Wentworth: A Nautical Tail,” mostly because the problem lay with me (I had trouble relating to rats, even ones with human feelings, and despite the initial comedic tone). In her science fiction, she does not use jargon to a dizzying degree, nor does she spend too much time on exposition–and best of all, she doesn’t sacrifice the complexity of human (or post-human or sub-human, or even anthropomorphic animal and spirit) life in favor of a richer setting. Rather, the complexity I mentioned serves to enrich her settings. My favorite story has to be “Eros, Philia, Agape” which is about a human-looking android leaving his wife and adopted daughter in favor of figuring out what it means to possess and to love. I closed the book for a while and wallowed in the feelings that story gave me. But that is not to say that the fantasy stories don’t have that kind of depth either. “Fields of Gold” was by turns funny, sad, horrifying, repulsive–and yet altogether illuminating. It examines the life and death of the protagonist Dennis, his marriage to antagonist Karen, his relationships with select family members, and what the afterlife might be like for each person (a sort of Five People You Meet in Heaven, although not exactly). It is interspersed with amusing bucket list items from Dennis’s life. I guess what I’m trying to say is that Rachel Swirsky has incredible range of length, voice, character, and ideas. But more than that, she has the gifts of weaving insight into humanity into incredibly poignant moments, of pushing what is harsh and ugly and dark to the fore and humanizing it, of seeing the stories in the margins, to quote “Scenes from a Dystopia” (which is completely surprising in how metafictional it is). She loves writing about the breakdown of human relationships and yet–and yet–within each story, she always puts a tiny glimmer of hope. Maybe not a hope of things getting better, but finding hope elsewhere. I went through a stage in my own writing wherein I thought of crazy ways to tell a story and then dismissed them as silly later on. I feel like Swirsky went through this stage also, but embraced those ideas and turned each of them into a gem whose brilliance is enhanced by the very simplicity of the container. Her stories are quietly devastating–but also quietly uplifting. Read them when you want to have your heart broken.